Dalat – the land of flowers – is one of the most famous tourist cities in Vietnam. 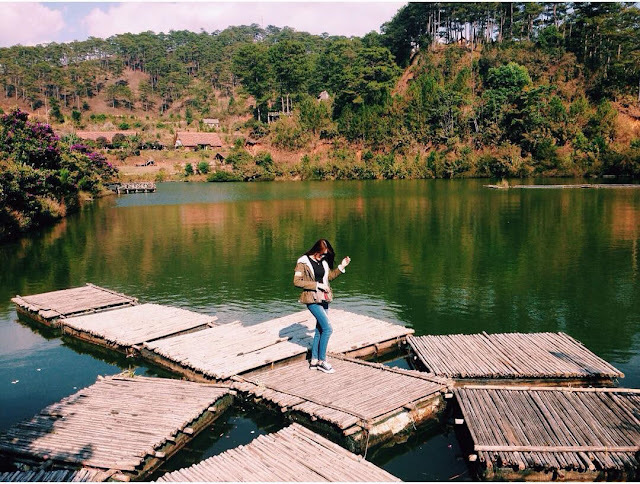 This romantic land has a great number of beautiful landscapes for you to explore in your Dalat tour, such as Xuan Huong Lake, Love Valley, Lonely Tree, and Cu Lan Village – one of the most beautiful villages in Vietnam. If you are on a Dalat tour for family, you should take the time to visit this pretty village at least once. Cu Lan is a small lovely villlage (about 30ha), located under the foof of Langbiang mountain, about 20km from Xuan Huong lake. This beautiful village is covered by a large prestine forest, near a murmorous shalow stream. The whole view creates a wonderful green paradise. Its location is in a small picturesque valley, attracting a great number of visitors coming here for sightseeing and exploring as well as enjoying a relaxing Dalat countryside tour. 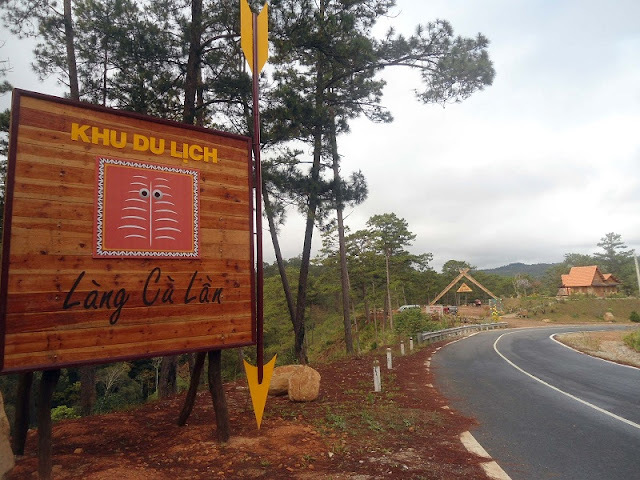 This land is a part of the famous historical road of Eastern Truong Son, connecting Dalat city with Dak Lak province. This famous tourist village of Dalat is the hometown of K’Ho ethnic people. There is a stream flowing around the village, which is the main source of water for people living in this village. Cu Lan village is the first cultural and ecotourism site which was planned and designed clearly and specifically in Lac Duong. This village is constructed in a familiar but harmonious and strange style to some extents. Entering the village, tourists will feel the peaceful, prestine, pure and stunning beauty. You totally forget the tiredness and harmornise with the nature, with green forest, charming pine hill, the babble of the stream, fresh lake, flower gardens and small cute houses. The combination among wild nature, poetic landscapes and exciting daily life of local people will blow your mind away and take your breath. This pretty fairyland is named after a man – Cu Lan. As a fairy tale handed down for generations in the village, once upon a time, there was a man living in plain moved to this highland. He went to the forest with a dream of building up a heaven in the forest for his lover from the stones he collected. Because of his naive and foolish dream as well as actions, people called him “Cu Lan” – practical, minded idiot. Since then, people have called this village “Cu Lan”. Many others said that the village was named after a plant species growing alternately in the forest, or the name of a rare animal species in the Red List. Cu Lan tree is a medicinal plant which helps stop bleeding in the wounds. Local people also use the wood of this tree to carve and make lovely souvenirs for visitors as a gift from Ta Nguyen forest. Besides, the animal named Cu Lan is a small species which looks like both monkey and panda with big round black eyes, very beautiful. These small animals can be raised as pets. 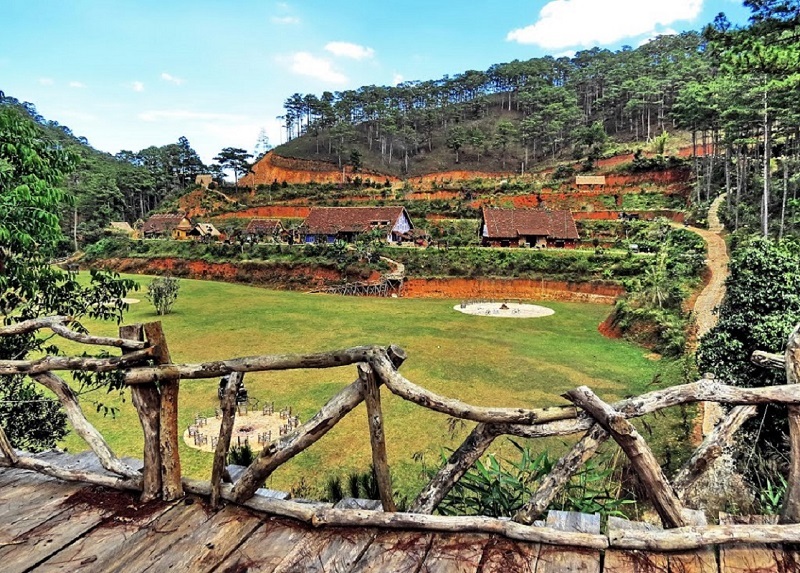 Visiting Cu Lan village for a Dalat tour, you can take part in many exciting outdoor activities, soak in the fresh nature, fly kites, catch fishes, climb up the mountains, row a raft, and so on. You can try some thrilling activities like going through swing chain bridges. It would be very exciting and interesting when standing on two chain bridges linking with each other perching across the stream and leading to the village. You will feel a little bit excited when they swing under your steps. 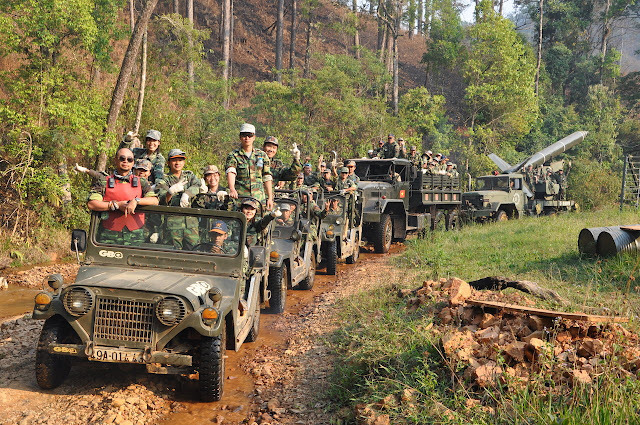 If you hesitate to walk to the village, you can choose to use the service of Jeep cars. This service will cost you about $6.5 per adult, including entrance ticket. These cars will cross forests, climb up the hills, wade across the stream, and give you an extremely fantastic trip. You will see lovely wooden houses in Tay Nguyen’s architectural style looming behind the pine hill nearby the lake or the stream. Old pine leaves occasionally fall in and create a thin layer of leaves on these house roofs, making a peaceful, deserted scenery of Cu Lan village. The afternoon in this village is quite peaceful and poetic with the cool gust of wind, the green valley blurs in smoke and mist. Picturesque scenery and mild weather make Cu Lan, Dalat an attractive and must-see landscape where you can visit all year round without worrying about the best time to visit Dalat. Visit this fairyland and enjoy a relaxing countryside tour to one of the most stunning villages in Vietnam.